ORDA Should Not Play Games With Article XIV | Protect the Adirondacks! The Olympic Regional Development Authority (ORDA) manages this area for a variety of winter Olympic sports – cross-country skiing, biathlon, bobsled, and luge, among others. 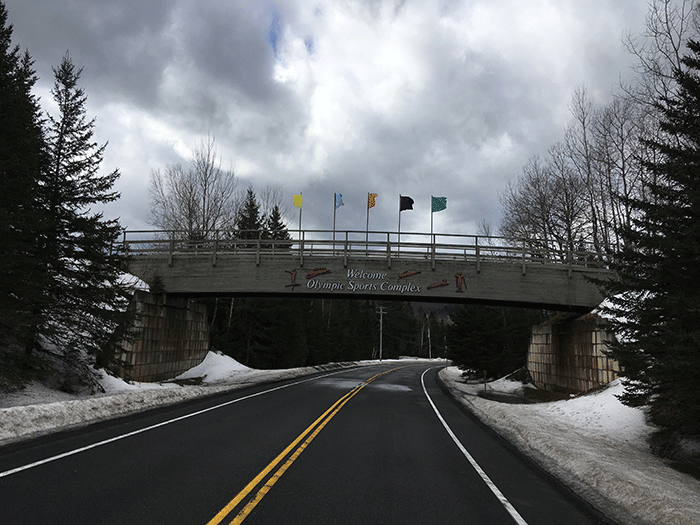 It’s also a popular cross-country ski area for the public, and starting in 2018 it became the staging area for a new trail to Cascade Mountain, where the public can start hiking in a safe parking area. The facility is located partly on land owned by the Town of North Elba Park District and partly on the State Forest Preserve. The Forest Preserve lands are protected as forever wild by Article XIV of the State Constitution. The problem today is that ORDA is planning to undertake a series of improvements and upgrades to its facilities, which would involve the cutting of 3,528 trees on about 5 acres of the Forest Preserve. This count includes only trees of 3” diameter or more at breast height (DBH), because this is the size that the State of New York has heretofore considered to be legally a “tree” or “timber” under the Constitution. Many thousands of smaller trees would also be cut as part of the project. The expanded facilities on the Forest Preserve would include widening cross-country ski trails, building new trails, expanding the parking lot, upgrading the biathlon stadium, and improving the driveway to the main lodge. ORDA sought a legal analysis of its plans from the Department of Environmental Conservation (DEC), which green-lighted the project. Ironically, these facilities are located at Mt. Van Hoevenberg the site of the most important legal decision upholding Article XIV, Section 1, the forever wild clause, known as Association for the Protection of the Adirondacks vs. MacDonald. Alexander MacDonald was the Commissioner of the Conservation Department (DEC’s predecessor) in the late 1920s and early 1930s, and as such was in charge of the care and custody of the Forest Preserve for the State of New York. A 1929 law passed by the Legislature directed MacDonald to construct a new bobsleigh run on Forest Preserve land on the western side of the Sentinel Range. This would have seen the cutting of 2,500 trees over a 4.5-acre area. The Association (a predecessor of Protect the Adirondacks!) sued to uphold Article XIV. The Appellate Division, Third Department, and the Court of Appeals both found that the State’s proposed actions would violate the forever wild clause. These decisions have provided some of the most articulate writing about the importance of Article XIV in our history. The Association decision was issued by the Court of Appeals in March 1930. The result was that the State shifted its planning for the bobsleigh run from the Forest Preserve to the land on Mt. Van Hoevenberg that is now owned by the Town of North Elba. Today, ORDA manages the Mt. Van Hoevenberg facility on lands that straddle Town land and the Forest Preserve. The majority of the facilities, such as the bobsled and luge track, biathlon range, most of the ski trails, and the stadium area are on Town lands, where ORDA can operate without constitutional restrictions, while the parking lots, main lodge, and other facilities are on the Forest Preserve, where ORDA must comply with Article XIV as well as the Adirondack Park State Land Master Plan. Giving to the phrase “forever kept as wild forest lands” the significance which the term “wild forest” bears, we must conclude that the idea intended was a health resort and playground with the attributes of a wild forest park as distinguished from other parks so common to our civilization. We must preserve it in its wild nature, its trees, its rocks, its streams. It was to be a great resort for the free use of all the people, but it was made a wild resort in which nature is given free rein. Its uses for health and pleasure must not be inconsistent with its preservation as forest lands in a wild state. It must always retain the character of a wilderness. Hunting, fishing, tramping, mountain climbing, snowshoeing, skiing or skating find ideal setting in nature’s wilderness. It is essentially a quiet and healthful retreat from the turmoils and artificialities of a busy urban life. Breathing its pure air is invigorating to the sick. No artificial setting is required for any of these purposes. Sports which require a setting that is man-made are unmistakably inconsistent with the preservation of these forest lands in the wild and natural state in which Providence has developed them. This bobsleigh run and return-way require the clearing of four or five acres of forest lands, the cutting of 2,600 trees which must unquestionably be regarded as of “timber” size and the blasting of some fifty cubic yards of rock from their natural state, to say nothing of the cuts and fills of earth and rock which will be required to make the slide an even and safe surface for the sport and the return-way possible up a steep slope to the top of the slide. If clearings of timber from lands owned by the State in the Forest Preserve are sanctioned for such a purpose, they are equally sanctioned for the construction of public automobile race tracks, toboggan slides, golf courses, baseball diamonds, tennis courts and airplane landing fields, all of which are out of harmony with forest lands in their wild state. There will be no limit to such encroachments that will crowd through the door of such precedent, if established. As we view it, the Legislature has no power to open that door. If the People desire to use their great park for such recreation a constitutional amendment is necessary. Tobogganing [bobsledding] is not the only outdoor sport. Summer sports in the Adirondacks attract a larger number of people than the winter sports, simply for the reason, if no other, that the summertime still remains the vacation period for most of us. The same plea made for the toboggan slide in winter might be made for the golf course in summer, or for other sports requiring the use or the removal of timber. In other words, this plea in behalf of sport is a plea for an open door through which abuses as well as benefits may pass. The Constitution intends to take no more chances with abuses; and therefore says the door must be kept shut. The timber on the lands of the Adirondack Park in the Forest Preserve, or that on the western slope of the Sentinel range, cannot be cut and removed to construct a toboggan slide simply and solely for the reason that section 7, article 7 of the Constitution [now Section 1, Article XIV] says that it cannot be done. Consequently … permitting the erection of this bobsleigh slide and the destruction of the trees is unconstitutional …”. The question facing ORDA and the DEC today is: if the cutting of 2,500 trees on 4.5 acres for a winter sports facility was found to be unconstitutional in 1930, why is the cutting of 3,518 trees on 5 acres for a similar facility somehow allowable today? The Mt. Van Hoevenberg facility is important for the region. ORDA makes a strong case that it must upgrade its facilities to meet minimum standards so that it can host world class events. Rather than playing games with Article XIV, ORDA should investigate a constitutional amendment that would remove acreage from the Forest Preserve and transfer it to the Town of North Elba so that it can undertake a variety of upgrades and expansions without running afoul of the Constitution. ORDA should make a case for whatever acreage it needs for its long-term planning, and offer to acquire replacement lands to be added to the Forest Preserve. Such a course of action would not only uphold Article XIV, but also ensure that the Mt. Van Hoevenberg facility has what it needs to succeed and support the Adirondack economy.